On a recent coffee buying trip, Crimson Cup strengthened relationships with Guatemalan Q Graders and met new coffee growers. Company Founder and President Greg Ubert plans a second trip to Guatemala this spring. We’ve been fortunate to develop a relationship with the De Leons over the years, and they help us source some of our best Guatemalan coffees. Coffee buyers from Columbus, Ohio coffee roaster Crimson Cup Coffee & Tea, Roast magazine’s 2016 Macro Roaster of the Year, recently returned from a sourcing trip to Antigua and Guatemala City. During the four-day trip, Coffee Buyer Dave Eldridge and Coffee Sourcing and Education Manager Brandon Bir cupped coffees, toured a coffee production mill, and visited local coffee farms and coffee houses. “We cupped some outstanding Guatemalan coffees with Q Graders Jorge De Leon and his son, Jorge De Leon Ovalle,” Eldridge said. Both licensed Q Graders, the De Leons help local coffee farms process and sell their coffee to roasters. 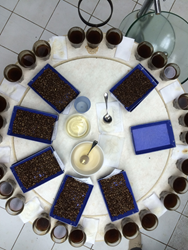 At the 2015 World Cup Tasters Championship, De Leon the younger ranked as the number-one Q Grader in Guatemala and number eight worldwide. During the trip, De Leon Sr. gave them an extensive tour of a coffee production facility in Antigua. “With Don Jorge Senior in charge of quality assurance, this is probably the cleanest, most organized mill we’ve ever seen,” Bir said. The Crimson Cup team was impressed with several of the coffees they cupped at the facility. They ordered samples for further evaluation at the Crimson Cup Innovation Lab. They were intrigued by one coffee produced by Omar Olayo on his farm in San Miguel Escobar, about a 30-minute drive from Antigua. They toured his farm as well as his mother’s adjacent property, where he does his drying and has created a micro wet mill. While at the coffee processing facility, Eldridge and Bir also committed to purchasing two full containers of the fresh crop of Guatemalan Olopa coffee. “This was a great find in 2015, when we became the first American coffee buyers to visit the small town of Olopa,” Bir said. Grown at 4,600 feet, these fully-washed and patio-dried beans are the pride of 20 small farmers near the town of Olopa in the Chiquimula department of eastern Guatemala. These small farmers draw on a rich history of coffee cultivation, which has been the area’s main source of livelihood for more than 80 years. They recently banded together to market their coffee through the Association of Producers of Olopa Coffee (Apolo) co-op and have begun to win local and regional awards.